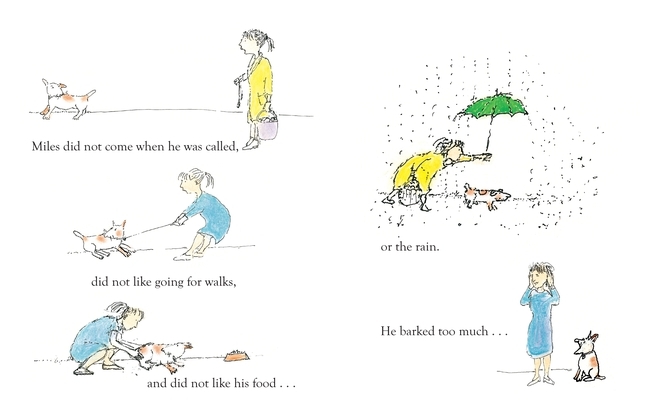 Effortless is the singular word I would use to describe both the stories and illustrations of John Burningham, who turned eighty last year and won his first Kate Greenaway Medal (the British Caldecott) in 1963. 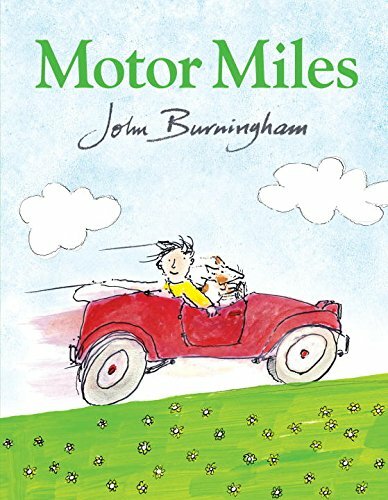 Somehow, he takes elements from everyday life like a difficult dog, a boy named Norman and a neighbor who likes to tinker and the next thing you know - Motor Miles! Miles "was a very difficult dog." He did not come when he was called, refused to go for walks and didn't like his food, or the rain or other dogs. And he barked too much. While Miles really liked were car rides and sitting in the cafe. But Alice Trudge, Norman's mother, and Norman couldn't take Miles to the cafe day after day. 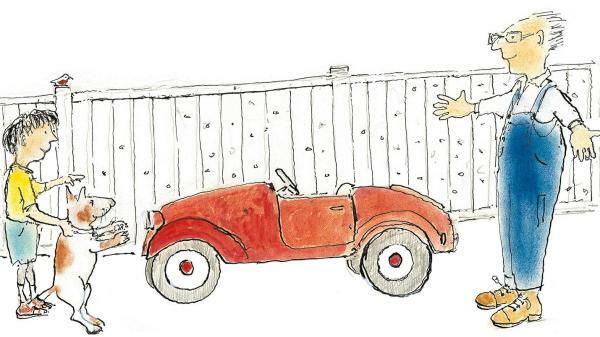 Happily, their neighbor, Mr. Huddy knew exactly what Miles needed - a car of his own. Miles has many driving lessons and is finally ready to hit the road. One morning, Alice can't take Norman to school and, in a moment of desperation all parents can relate to, she lets Miles drive Norman to school. After that, Miles and Norman start to take "secret little trips in the car." There are lovely two page spread of the pair motoring along the shore, through a field and through a pile of autumn leaves. Soon, Miles is a bit less difficult. But, Norman was getting bigger - too big for the little car Mr. Huddy made. Happily, the final page reveals Mr. Huddy's new project, something with wings . 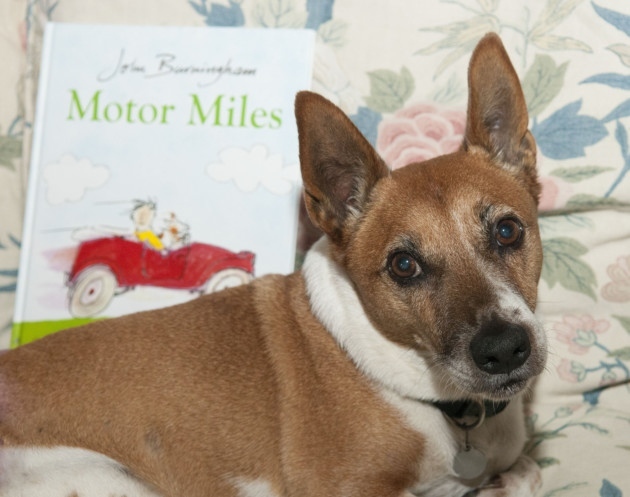 . .
A photo and dedication reveal the inspiration for Motor Miles, the REAL Miles, "much-loved, difficult dog," owned by Burningham and his wife, picture book illustrator and author, Helen Oxenbury! And, the real Miles really did only want to go on car rides and sit at the cafe. An illustration from the book is even based on a photograph of Oxenbury and Miles in the cafe together. The real Miles is also a less difficult dog now. As Burningham said in an interview about the book, "unconditionally love helps everyone, really."